Important: Not available to Solo accounts or our legacy pricing plans. You must be on a Starter, Business, or Premium subscription plan in order to take advantage of the free LOCALiQ Listings integration. Do you struggle to get the word out about your service business? You probably know about Google Maps and Yelp and Facebook and all the other places you can list your company online, but do you have the time to learn about each one and enter all your contact information over and over again? If you're like most Kickserv customers, unless you have a dedicated marketing person on staff, the answer is probably no. 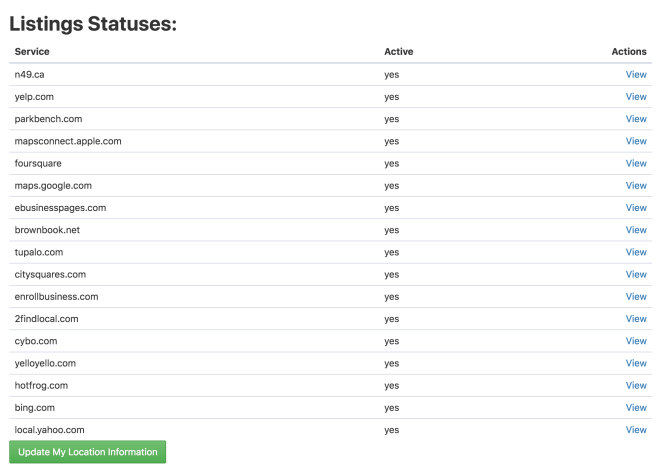 Every Kickserv account comes with 25 managed online directory listings from LOCALiQ, our partner company. Enabling Listings & Reputation Management for your Kickserv account is easy, automatic, and best of all, free. To take advantage of the built-in power of Listings, click the Sign Me Up button. You'll need to make sure your company name, address, website, and other contact information are correct and up to date; if not, Kickserv will ask you to update them. Once you've clicked the Update button, a LOCALiQ Listings account will be created for you. It could take some time (and you can continue to work while it runs), but you'll get an email with the details when it's done. Once your account is set up, you can see the status of all your listings by clicking Integrations on the main menu and then clicking the Listings & Reputation Management tab. That's it! The power of LOCALiQ Listings is yours! To learn more about the benefits of Listings & Reputation Management, check out this video.